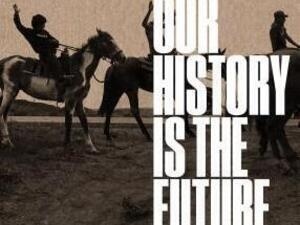 The book, Our History is the Future: Standing Rock Versus the Dakota Access Pipeline, and the Long Tradition of Indigenous Resistance, explores how two centuries of Indigenous resistance created the movement proclaiming “Water is life.” Talk features author Nick Estes, with Robert Nichols, Shiri Pasternak, and Jakeet Singh. In 2016, a small protest encampment at the Standing Rock Reservation in North Dakota, initially established to block construction of the Dakota Access oil pipeline, grew to be the largest Indigenous protest movement in the 21st century. Water Protectors knew this battle for native sovereignty had already been fought many times before, and that, even after the encampment was gone, their anti-colonial struggle would continue. In this book panel celebrating the publication of Our History Is the Future, Estes of the University of New Mexico traces traditions of Indigenous resistance that led to the #NoDAPL movement. Estes will be joined by three prominent political theorists: Shiri Pasternak of Ryerson University, Robert Nichols of the University of Minnesota, and Jakeet Singh of York University, who will respond to the book and elaborate on its implications for scholarship and movements against settler colonialism. Sponsored by the JD Lewis Memorial Fund.